Yup, you guessed it, 7.35am Christmas Day morning, Chaos is in command of LIttleville and I already back from our first Grade 1 (or Priority or Level 1 or IR or whatever they call it in your part of the world). 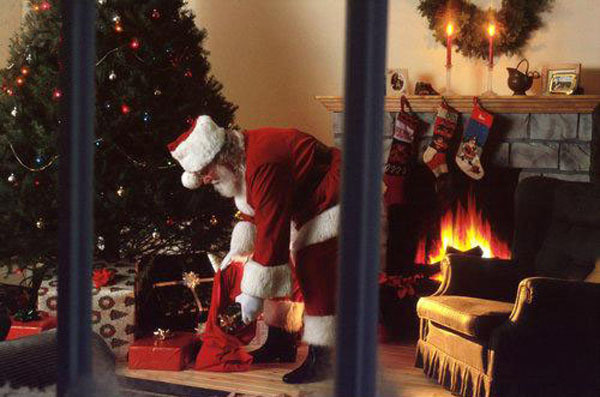 Seems little Jimmy Williams (obviously not his real name, that’s S#!th£@d but the names have to be changed to protect the innocent) had awoken on Christmas morning to find Santa had left him the wrong present and his long-suffering mother was bearing the brunt of his displeasure. Apprently Father Christmas had delivered an Xbox instead of a PS3 …. or the other way round, I never did work out amongst all the f’ing and blinding Jimmy and him mum, accompanied by both his brothers and sister were doing. The only one in the house who wasn’t swearing or being generally abusive in one form or another was Stavros, the obligatory Staffordshire Bull Terrier. Then again he might well have been, I don’t speak dog I’m afraid to translate what the barks were. Interesting side point here; I once asked Jimmy’s mom why they called the dog Stavros, rather than Killer, or Snarl, or other such common names that these outstanding members of society call their mutts. It transpired they were all massive Doctor Who fans and so called the dog after the leader of the Daleks. I tried to point out that was Davros, but I got nowhere – no nothing us coppers you see. Still, no one was dead, no one was bleeding, and in the short time I had been there, Jimmy had put aside his hatred for whichever games console he was now the no so proud owner of, and was battling enemy troops on a far and distant world. I wiped my feet on the way out, as is the norm, and walked back through the rubbish strewn front garden to my nice clean and tidy panda to return to the station ready to complete what I was sure would not be the first domestic type report of the day. Whilst doing so I did consider the option of tracking down Santa and hauling him in for causing the whole bloomin’ problem in the first place but didn’t really want to spoil hs day as well. Happy Christmas everyone ! … unless you don’t celebrate Christmas in which case Happy Holidays or Seasons Greeting or just enjoy a few days off the treadmill of normal life and relax . :o) …..
And don’t forget, whist you are enjoying yourself roasting chestnuts by an open fire or cracking open copious cans of cheap lager without a care in the world, your friendly police, fire and ambulance crews have foregone their time at home to make sure you are safe ! Please, someone, give me a break !!! 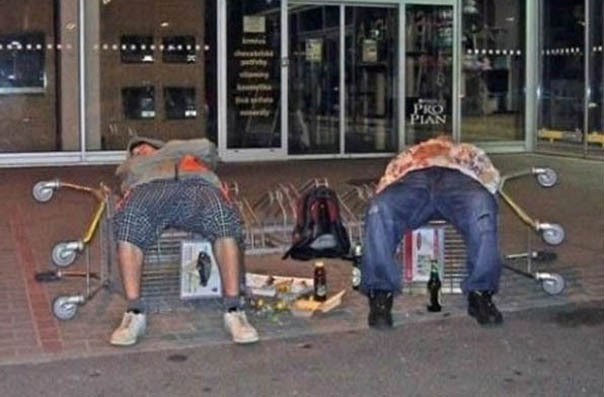 So there we were, the whole night shift; all two of us plus the Sergeant, called to a local hostelry by the barmaid (sadly not of the buxom variety – whatever has happened to conditions of employment these days lol) who was having difficulty removing a nuisance customer. Well I say customer, he hadn’t actually purchased any of the fine beverages on offer at this particular establishment, much preferring to save his custom for the local late night shop down the road where he had purchased (possibly, alternatively he might have just helped himself) to the obligatory two 3 litre bottles of Frosty Jacks and consumed them as rapidly as possible in what your ever frustrated commentator can only presume was all in the interest of scientific research. His venture into the aforementioned public house was merely to use the facilities – except he hadn’t managed to get as far as the toilets and had decided his best course of action was to urinate on the bar area floor – how he didn’t ‘get taught good n proper’ by the pubs regulars is still beyond me but they did things the correct way and called the Old Bill. The bar maid didn’t want to make a fuss, certainly didn’t want to make a complaint and just wanted Mr Idiot out of her fine establishment and so there we were, trying to avoid any contact with the various bodily fluids emanating from this fine example of human kind and offering him genuine words of advice about his actions and future conduct. Okay, so it started politely with a ‘come on chap, time to go home’ but descended quickly after the torrent of abuse which fell from his lips. I really could not be bothered with wasting any of the public purse in processing this waste of oxygen through the system so it was a matter of escorting chummy out and into the fresh air accompanied by my pearl of wisdom “Isn’t it about time you grew up ?”. Well that was it “I WANT TO MAKE A COMPLAINT, YOU CAN’T TALK TO ME LIKE THAT !! !” All things considered I was fairly impressed he’d managed to formulate a word containing two syllables given his level of intoxication but there were were. Having been further encouraged on his way by ourselves and the skipper, perhaps I shouldn’t have been surprised to receive the radio call form the inspector an hour later asking us all to attend his office. Now here’s a bloke who’s not emerged from behind his desk for a very long time except to visit the custody block to do the PACE reviews; and even then most of us reckon the only reason he’s so keen on that is because they’ve got a TV and coffee maker always on the go in their back office. It appeared our toilet troll had made several 999 calls from his mobile after we finally got rid of him, all to complain about the brutal treatment by police and the way “one of them fuckwits’ spoke to me”. The mere fact someone entertained his ramblings would no doubt surprise the casual reader, but not to us nasty, evil, must have been bullied when we were younger, persons of ill repute and unmarried mothers. For reasons best known only to our inspector, although his current promotion chasing probably had a lot to do with it, he’d decided he was going to investigate this complaint – his apparent logic being that if the bloke had been committing offences we should have dealt with him ‘positively’ and if he hadn’t then we had no cause or reason to treat him with anything but the highest respect …..
Just remember this dear reader, the next time you flick that fag ash in the air …. littering that is …. And we’ll deal with you ‘positively’ !!! When it’s got big yellow and blue stickers on and flashing blue lights on top – that’s when !!! What is it with alcoholically deranged people that insist on flagging down every passing police car in Bigtown on a Friday and Saturday night and asking, nay demanding, a lift home ? My colleagues and I have heard all the excuses from ‘I’m lost’ to ‘you’ve got to take me home, it’s the law’ to ‘if I get punched/raped/murdered/covered in cold sloppy custard it will be your fault’. Needless to say this always happens within a few feet of the nearest waiting taxi or mini-cab and is always met with great politeness from your upstanding and patient law enforcement souls, along with a friendly indicator aka pointing finger, towards the said waiting conveyance. The response is generally something slurred which I believe is meant to say “But I’m afraid, my fine and upstanding member of the law enforcement community, it appears that I have foolishly relieved myself of all my appropriate funding to employ the operator of that said carriage to deliver me to my homestead”. However, it normally comes out as something like “Blurrgghh uuurrrkkk aaarrrgghhh” followed by projectile vomiting. Personally I like to be consistent, so my reply is always, without fail, along the lines of “Taxi, walk or a lift to the cells”. Strangely, despite being drunk to the level they they can’t even remember their own gender, not many opt for option 3. 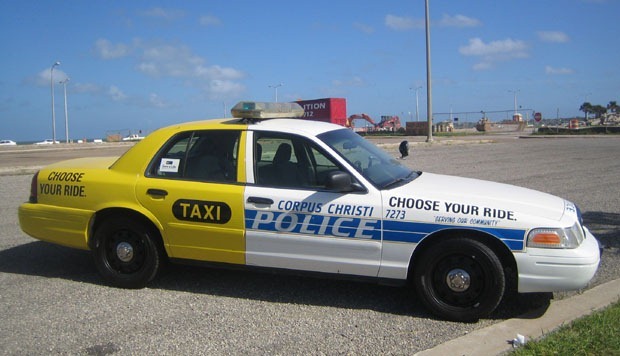 By the way, the picture at the top of this post is not a trick of Photoshop – many American police forces have ‘cruisers’ liveried like this to act as a warning to potential drink drivers and night time drunks about what will happen. Many taxi companies even pay to have their phone number on the back of the police vehicle so the ever-helpful gun-totting American cop doesn’t even have to speak – he can just grunt back and point …… or just shoot ….. which is what probably happens. I popped over to visit my mother yesterday, keen to confirm a couple of facts following a ‘discussion’ I had with an ever-so-slightly exciteable club-goer the night before. I didn’t know that he potentially had such an insight into my family pedigree so wanted to question Mommy Chaos about the apparent gaps in my ancestral knowledge. Apparently however, it turned out my mother and father were married at the time of my birth, and prior to retirement mum had taken the rather boring career choice of office number cruncher rather than that of the far more exciting and glamourous ‘lady of the night’. I guess due to the intoxication level, said club-goer had got me mixed up with someone else. Easy mistake I suppose. Ask any police officer why they joined the job in the first place and there’s a very good chance the answer will be ‘I wanted to make a difference’ or ‘I wanted to help people’. Then ask the same police officers if the reality of the job met their expectations and I’d put money on the answer being a big fat ‘NO’. Take me for example (please do before the men in the white coats get me) – I joined the police later in life, as did several of my colleagues. We were all deemed by our age to have lived and worked in the real world (hopefully I am still there) and had what the buzz word people at headquarters called ‘life experience’. This apparently meant we had seen and done a fair bit in our time and could be trusted to be impartial, knowledgeable and deal with peoples’ problems sensibly and compassionately. Although never for once did I think I’d spend any of my time wandering through the green and pleasant lands of our countryside; marvelling at the wonders of Mother Nature. I knew, from day one I would be thrust into the concrete jungle, the realm of Britain’s social underclass (affectionately known as The Great Unwashed). What started very well very quickly became disheartening when the realisation set in that there is very little interest in reducing crime coming down from the top, as long as the soundbites are good and the Government of the day has a fair chance of re-election. Sadly, as time has gone by, too many fingers have been put in the pie by politicians and people who have no concept of a) what policing is all about and b) what happens in the real world – It’s fair to say that most of the people making the decisions that affect the lives of us normal folk (and yes dear reader that includes us uniform wearers), have never had to set foot on the 16th floor of a terribly run-down block of council flats; have never experienced what it’s like to be in your 80’s, living alone in a one bed bungalow, having to make the daily decision whether to eat or heat; or had to deal with the consequences of your own child dying of a drugs overdose. Policing, by virtue of it’s nature, is not a difficult job to do – left to get on with the job, we hunt down criminals, solve crime and get people locked away so they can’t do any further harm to decent members of society. Sadly, that’s too much for some people, and a whole industry has ballooned with the sole mission of making this simple task as difficult as possible. Now I wouldn’t suggest for one minute that we should throw caution to the wind and chuck people in the clink on a mere whim, but when you’ve arrested a shoplifter for his 147th offence and he’s still at it unabated, you have to ask what benefit it is to society as a whole for him to still be walking the streets. 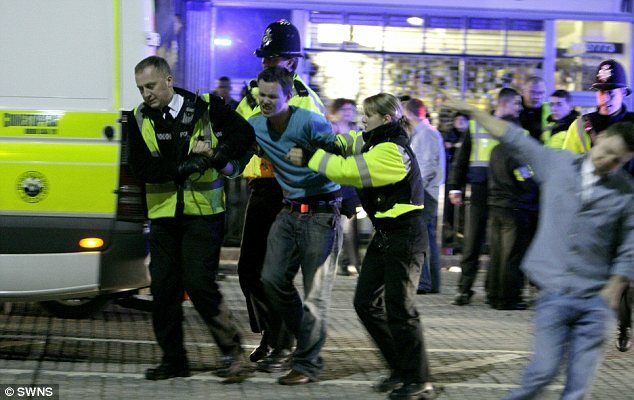 The great majority of the general public never have any dealings with the police ….. ever ….. at all ….. full stop. The unfortunate minority of the said proportion of society that come into contact with the police do so because their car has been broken into / been stolen or their house has been burgled – and to keep things in perspective, it’s not a great number. These are genuine victims of crime and every police officer will work his/her guts of to try and help them – normally in the face of great adversity, mainly caused by the great God of red tape – forget what you’ve heard in the Government spin about reducing paperwork, on the day the Home Secretary did her sound bite about how frustrating it was that we have to complete 70 odd pages of forms for a burglary and how wrong that was, we were issued with another 10 page form to fill in as well as everything else !!! Again, with violent crime, there are not a lot of, for want of a better word, ‘innocent’ victims. The statistical chances of you walking down the street and a complete stranger walking up to you and hitting you for no reason are not that great – most violent crime needs a couple of ingredients to make it work – alcohol and/or drugs and more alcohol and/or drugs on both sides, with perhaps the odd on-going neighbour dispute thrown in for good measure. The one obvious exception to this rule of course is domestic violence, which is deplorable by any sane persons standards. The small minority of people whom are regular ‘customers’ of the police are so because they generally fall into one of two categories – 1) They cannot control their own life and need someone (us) to do it for them, or 2) They are unable to control their own life to the extent that because they are not happy, they have to make as many other people as unhappy as possible. Add to this that the vast majority of acquisitive crime (theft, shoplifting, TWOC’s and burglary) is done by a very small number of people to feed a raging drug habit and the picture becomes much simpler – if we sent these people to prison to serve sentences in the region of the maximum that the offences they commit allow, we would not be sending vastly more people to prison – we would be sending the same people less, but for longer. And longer terms would allow far more intervention by people who can help with alcohol and drug addiction; can identify mental health issues that need addressing; and can help with proper rehabilitation needs. On top of that is the more obvious point that the longer the serial criminal is banged up, the safer the streets are and the less crime there is – everyone’s a winner !!!! Of course, the police do many other jobs as well as dealing with crime – we will happily search for you lost child / wife / granddad because that’s important too; we deal with RTC’s because they are important; we deal with plane crashes, suicides, bomb threats, murders and of course all those devotees to a good ‘smashed out of your skull’ Friday night, but on top of all of this, the powers that be are now directing more and more roles and tasks in our direction, because everyone else is having cutbacks (like we aren’t) and whereas your Social Workers, Environmental Health Officers, etc, go home at 5.00pm on the dot, we are here 24 hours a day ….. and we are a free service. The question is – with a system at breaking point, what happens when it tips over ?? ?